Rainbow Honey November Mystery Bag Unboxing! I cleaned up this month on Rainbow Honey looking for some great toppers for my nail polishes. 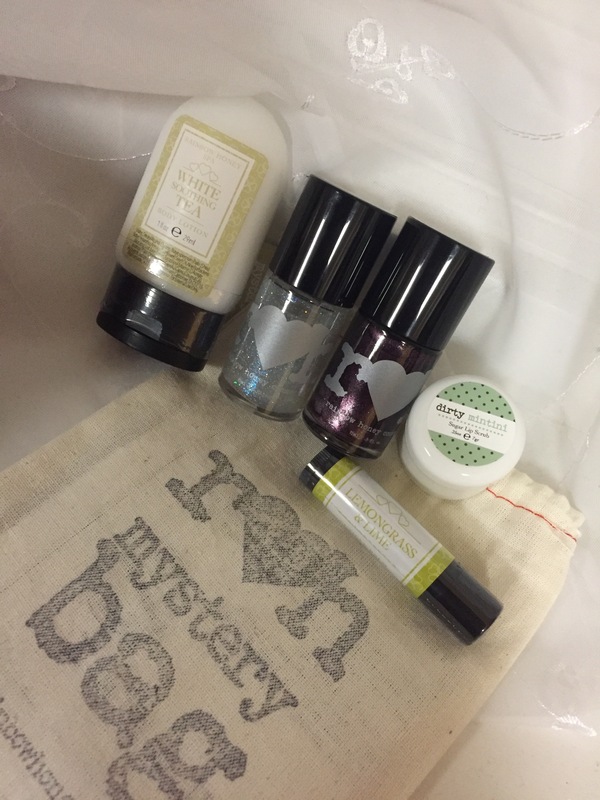 This got me the November Mystery Bag for free, so woot! I’m just excited as anything. After last month’s win with this company, I knew I wanted to make an order again. The colors are fun, fairly nerdy inspired, and there is a decent longevity, especially when I combined them with the Aurora Cosmetics top coat from their Gel Effects line that I picked up last month. I can’t believe the mini bag came with two full sized bottles! Amazing! Bloody Weapon Nail Laquer – This is a dark color with a lot of red in the purple and it shimmers. You cannot go wrong with bloody nails, especially if there’s a Zombie Apocalypse going on. Ok, I might just be enjoying Z Nation and The Walking Dead too much right now. White Soothing Tea body lotion – Travel Size for my pocket book and yummy spelling to boot. I love Rainbow Honey’s spa line already! It’s not oily or gross and you feel good when you are done using it. Dirty Martini Sugar Lip Scrub – Mini Pot. Ok, this is surprisingly awesome. I’m not really a martini girl, but there you go. Lemongrass & Lime Cuticle Balm – This looks like a chapstick tube, smells like spring, and lives up to the line, “the last cuticle balm you’ll ever need”! This does really wonderful things to my cuticles. Maybe that means my nails will be better? Yes, that’s more goodies in the background. I’ll be back tomorrow to share with you some other unboxing goodies! For now, I’m off to give myself a manicure because my nails need it! Make sure you hit me up so I can see what you’ve done with yours. This is only the beginning! My subscription boxes have only just started coming in. And I maybe indulged in some retail therapy with these things for November. It has been a rough month.